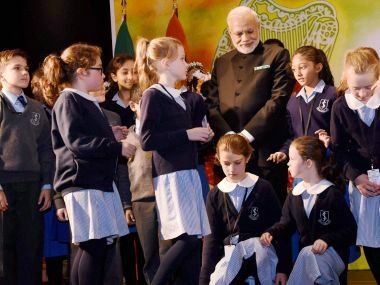 Dublin: With Irish children welcoming him by reciting Sanskrit shlokas, Prime Minister Narendra Modi on Wednesday took a dig at secularists back home saying had this been done in India it would have raised questions. 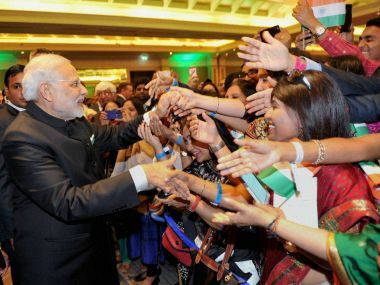 Addressing a gathering of Indian diaspora here, Modi, who made a five-hour brief stop-over en route to the US, said he was impressed by the way the children have internalised the message in the Sanskrit verses. "The Irish children were reciting shlokas in Sanskrit and singing welcome songs. It did not seem to me that they were just tutored. They were able to express the feelings of the words," the Prime Minister said during his short speech. "I congratulate their teachers. It's a matter of happiness that we can do it in Ireland. But had it been done in India, then questions would have been raised on secularism," he said. "Overwhelmed by the community programme in Dublin. Recital of Shlokas in Sanskrit by children was very touching. Simply mesmerising! Great to see these children recite in Sanskrit," Modi tweeted. Asserting that India was among the top countries witnessing rapid economic growth, Modi said the whole world is talking about India and even people are thinking "who knows, 21st century can be India's". The Prime Minister said the World Bank, IMF and all rating agencies are quite upbeat about India. If there is someone powerful in BRICS (Brazil-Russia-India-China and South Africa) grouping, it was India, Modi said adding that unlike earlier years when 'I' which stood for India was hanging and there was an apprehension that it will be replaced by Indonesia. Modi also said that there will be "no trace" of poverty in India if it could sustain the current momentum of development in the next 30 years. Showcasing India's potential and rapid economic growth under his government, Modi said 65 per cent population of India is under 35 and they are real assets to take the country to newer heights. The Prime Minister began his address by saying, "want to apologise as I think I should've given you all more time" as the trip is a short one. "One passes over Ireland every time one flies to New York. Your love has brought me here this time," said Modi. Modi, who is the first Indian Prime Minister to visit Ireland in 59 years, told the crowd that they will not have to wait for that long for next visit by an Indian Prime Minister. Talking about initiatives of his government, Modi said "today Indians across the globe can live holding their heads high and see eye-to-eye with everyone as equals." He said there are so many things which are common between India and Ireland and both the countries can expand cooperation in various areas. The Prime Minister said he had "detailed discussions" with his Irish counterpart Enda Kenny and both agreed on so many issues. Talking about yoga, Modi said it has received recognition globally. In 2016, Ireland will celebrate 100 years of their independence movement. India too has battled colonialism, Modi said. "I think India should participate in the celebrations," the Prime Minister said.